No one from Region 3 did as well at 2018 IHSA Nationals as Caroline Molther of the University of Kentucky (on right). From Denver, Colorado, Molther won the individual open on the flat class on May 3rd at the Pennsylvania Farm Show Complex in Harrisburg, Pennsylvania to become the National Champion in the division. Molther is seen here with IHSA Founder and Executive Director Bob Cacchione after prevailing in the field of 16. Seen here with head coach Missy Jo Hollingsworth, Jacob Kamm of the University of Cincinnati represented Region 3 at 2018 IHSA Nationals in the individual AQHA High Point Rider competition. From Germantown, Ohio, Kamm was out of the top ten but had the ninth-best Reining phase score. Judges Charlene Carter and Allen Mitchels awarded Kamm a score of "141.5' which was a better score than 15 others who were entered in the two-phased division to determine the top western rider in the IHSA for the 2017-18 season. 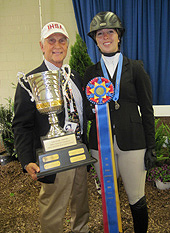 History was made on April 7th when Piper Tomlin of Georgetown College (on right) placed second in individual walk-trot at Zone 6 Zones in Westerville, Ohio. 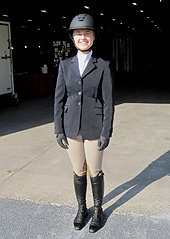 This made Tomlin the first rider in the history of the Georgetown College program to qualify for IHSA Nationals. 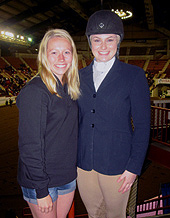 Coincidentally from the town of Georgetown, Tomlin is seen here with team captain Ashley Duvall in the stands at the Pennsylvania Farm Show Complex a few hours before competing at Nationals in the individual walk-trot. She did not place inside the top ten, but Tomlin is still the only Georgetown College rider to get there, and she has three more years to try and work her way back as Tomlin was only a freshman in 2017-18. Only one Region 3 rider who competed in an undergraduate individual class at the Hamburg, New York Semifinal advanced through to 2018 IHSA Nationals. 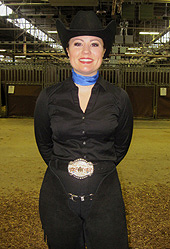 That rider is Alexandrea Hemberger of the University of Kentucky (pictured). 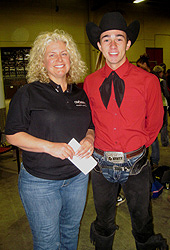 From Auburn, Illinois Hemberger was fourth in individual intermediate western horsemanship at Semifinals on March 26th. No other Region 3 rider made the top four individually that day. Hemberger is seen here near the stall area at the Pennsylvania Farm Show Complex at which she finished her sophomore year with a tenth in the same division at Nationals on May 6th. 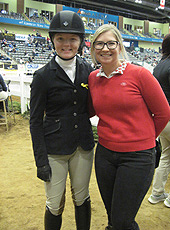 Seen here with head coach Sarah Younger, Lilli Power of the University of Louisville (on left) has competed in the Cacchione Cup Competition at each of the past two IHSA Nationals shows. Coincidentally from the town of Louisville, Power has been very consistant over fences in this phase of the competition. When this photo was taken in Lexington, Kentucky in 2017 Power was the 28th rider to show over fences and received a combined Judge's score of "73.5." A year later in Harrisburg Power had the unenviable honor of going first over fences (the field shrunk from almost 40 riders down to 24 for the record) and received a combined Judge's score of "73." While Power went first in the Cacchione over fences phase Casey Menna of the University of Kentucky (pictured) was the first Region 3 rider to compete in any division at 2018 IHSA Nationals. From Norristown, Pennsylvania Menna went tenth out of sixteen riders entered in individual intermediate over fences on May 3rd and received a combined Judge's score of "79.5." which would eventually result in eighth place. Almost a month earlier Menna placed second in back-to-back classes at Zone 6 Zones. Menna put the Wildcats on the board in the team competition with a second in team open over fences before getting right back on and placing second in individual intermediate over fences to get through to Nationals in the latter. Schools competing in Zone 6, Region 3 during the 2018-2019 school year: Georgetown College, Miami University of Ohio, Midway University, Morehead State University, Northern Kentucky University, University of Cincinnati, University of Kentucky, University of Louisville and Xavier University of Ohio.